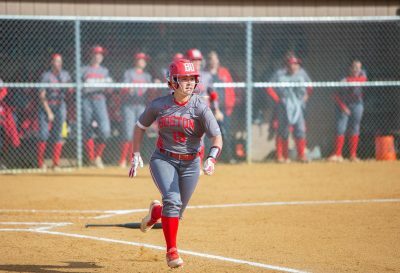 Trailing by one run in the sixth frame, the Boston University softball team scored to walk-off their Green Line rival Boston College Wednesday afternoon. In the seventh inning, the Terriers were down 2-1, and the Eagles were three outs away from holding back the Terriers and getting the win. With two players on base for the Terriers, senior infielder Emily Morrow slugged a triple to center field off of BC (11-20) right-handed pitcher Susannah Anderson, bringing home senior utility player Analisa Ruff and freshman outfielder Izzy Antonelli. Sophomore righty Ali DuBois took the mound for the Terriers Wednesday. The Connecticut native twirled five shutout frames, only surrendering a lone hit and giving up no walks. She also had no runs charged against her through the game. DuBois capped these five shutout innings by escaping a first and second one-out jam in the bottom of the fifth. With BC infielder Jenna Ergle on base after a hit-by-pitch and infielder Kennedy Labshere poking a single right after, DuBois managed to get infielder Kristin Giery to ground into a double play, leaving two Eagles on base and allowing the game to remain tied at 0-0 after five. Anderson stood her ground well in the first five innings as she opposed DuBois. In the fifth, after hitting senior infielder Madi Killebrew with a pitch to start the fifth, Anderson collected three straight outs to retire the side. The sixth and seventh frame saw both teams opening the scoring books. In the top frame, DuBois managed to collect two quick outs, but getting the third out would not come easily. First, eagle outfielder Ellie Mataya hit a double. Then, Eagle infielder Carly Severini reached on an error, allowing Mataya to score. This run would go uncharged to DuBois. A single from BC catcher Allyson Moore would bring Severini home, which would be the second uncharged run scored for the Eagles against DuBois. The Terriers would enter the bottom half of the sixth down 2-0 and would score a run to get within one. With two runners on base and two outs, senior catcher/infielder Alexa Ponce would get a single, which allowed Morrow to score. The remaining runners would be left on base, as Killebrew grounded out in the next at-bat to end the inning. DuBois would hold back BC in the top of the seventh, allowing BU to have a chance to come back from a one-run deficit in the bottom of the seventh. The inning started with sophomore infielder Marina Sylvestri working a 2-2 count in her favor by drawing a walk. Freshman infielder Nicole Amodio would then drop a sacrifice bunt to move Sylvestri to second base. In the next at-bat, Ruff would get hit by a pitch to put two runners on, followed by Gant striking out, putting the Terriers to their final out. This is when Morrow would come in and be the walk-off hero, with her game-winning triple to score both Ruff and Antonelli. Morrow credited her teammates in allowing her to get the opportunity to win the game for the Terriers. Waters discussed Emily’s approach to this key at-bat that allowed the Terriers to win the game. Coming next for the Terriers will be a three-game weekend series against Lehigh University. Waters said she knows the team will be facing a formidable opponent in the Mountain Hawks (11-19, 3-3 Patriot League).